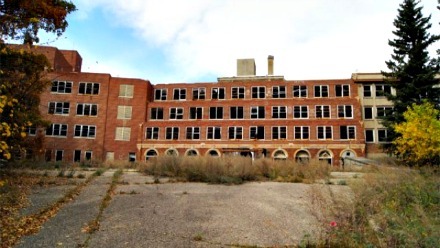 San Haven Sanatorium was opened in November of 1912 to deal with the rising number of tuberculosis sufferers. Originally known as the North Dakota Tuberculosis Sanitarium it was built on the south slope of the Turtle Mountains because of the high altitude, less snowfall, drier atmosphere, and favorable conditions for patients with tuberculosis. Roughly around 50% of all tuberculosis sufferers died from the disease before the introduction of antibiotics a common method for dealing with the illness was for a lung to be surgically collapsed while it healed. Thousands of patients received treatment for the disease up until the tuberculosis epidemic came to a close at the end of the 1940's. The Sanatorium was turned into a home for the mentally disabled until in the 1980's its door shut for good and it has remained abandoned ever since. The Sanatorium has a very uneasy atmosphere. Being so secluded and high up in the mountains there is a very uncomfortable feel to the whole area, and that combined with the sight of the very decayed building makes for one creepy location. Exactly how many people died in the area is unknown, but in its life time there were thousands of people treated here and it had a cure rate of around 50%, meaning the other 50% more than likely passed away in the building. Much pain, suffering and death have taken place within these walls at the hands of the illness which put people here, and the early methods of treating the disease didn't help people have the most comfortable experience either. Perhaps this is the reason that so many spirits chose to linger here. A number of different ghost hunting groups have visited the site and non have been able to find even a rough number of different spirits which remain here. As for the ghostly experiences you can expect to encounter here they are really very varied. People have reported everything from orbs and apparitions to being touched and sudden nausia striking them without explanation. Faces in the windows and the corner of the eye sightings of moving objects are also common here, but there is really one very creepy thing which stand out here. There are a number of buildings within the sanatorium complex which are all connected by underground tunnels which were built so staff and patients could move between the buildings without having to suffer the harsh weather. It is within these tunnels that you are most likely to encounter an apparition, seemingly stuck in some sort of time lapse. Patients of days past have been witnessed walking silently through the dimly lit tunnels before fading into nothing.